This winter was the last winter for wild caribou in the contiguous United States. Last April, the only remaining herd known to migrate south of the Canadian border, was down to three members. This winter, one was killed by a cougar, one was lost and is likely dead, and the last, a female, was just flown to a breeding pen as a last ditch effort to keep her alive. 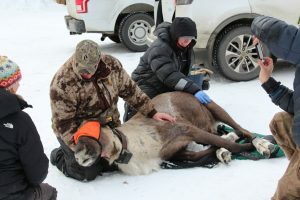 Government biologists in British Columbia captured the last known member of the South Selkirk caribou herd in January. They hope she will breed with captive members of another herd. 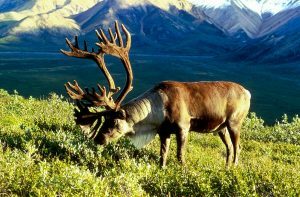 Also known as reindeer, caribou once thrived along the northern border of the United States, from Alaska to Maine. Long gone from New England and the Great Lakes (where Caribou Coffee got its name), the only remaining herd roamed the Pacific Northwest between Washington, Idaho and British Columbia. The South Selkirk herd was part of a larger group known as the southern mountain caribou. The population the southern mountain caribou has been steadily disappearing for decades, along with old growth forests, as reindeer feed on the slow-growing lichen of centuries-old trees. But even conservationists were surprised when it dropped to three last year. The last count was 50 in 2009. A team of Canadian and American experts has been working to salvage the South Selkirk herd, attempting to bolster the population with individuals from other herds, banning logging and snowmobiling in much of the herd’s range, and even culling wolves to protect them from predation. The Native American Kalispel Tribe in Washington state raised money to build a “maternity pen” for vulnerable herd members. But the efforts came too late. “We’ve really jeopardized their habitat over the last 30 to 40 years through unsustainable rates of logging,” Mark Hebblewhite, a Canadian wildlife biologist at the University of Montana, told the Guardian.